Ottawa August 11, 2017: Canadian students are invited to share their unique and transformative learning abroad experiences by entering their photos in the Canadian Bureau for International Education’s (CBIE) seventh annual student photo contest. “When Canadian students have a learning abroad experience they grow in ways that go beyond typical classroom learning such as leaps in cultural awareness, openness to different ways of thinking and self-confidence. These photos are great way of showcasing all these positive outcomes and we hope they will inspire other students to take advantage of learning abroad opportunities at their institutions.” Karen McBride, President and CEO, CBIE. Did you have a learning abroad experience as a student? Share how an international learning opportunity made for a lasting memory. How did your experience transform your view and enrich your study and work life? 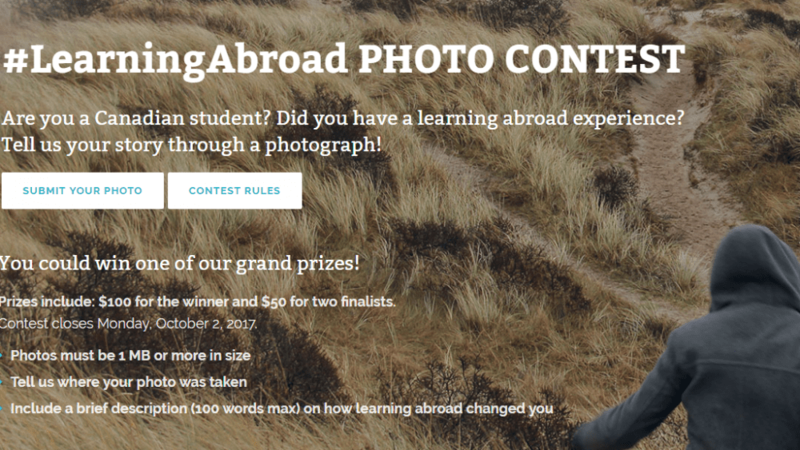 Let your photograph portray your own unique learning abroad experience. Contest closes on October 2, 2017. Submissions will be voted on and winners will be announced at CBIE’s Annual Conference in Halifax, Nova Scotia in November. Learn more and submit your photo.